Twelve South's vintage leather BookBook beautifully combines a wallet case, hands-free stand and removable shell. Convenient pockets store your ID, cards and cash. And BookBook also folds into a display stand for hands-free FaceTime chats and watching videos. Plus, it gives you the ease of a removable shell to protect your iPhone in or out of BookBook. Whatever your needs, this feature-packed case has you covered. 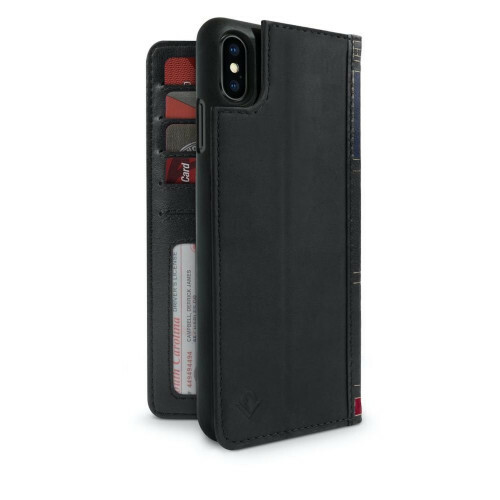 The wallet portion of this high-quality leather case has five pockets, including slots to hold your bank cards. There's a handy window pocket that lets you flash your ID when needed. You also have a full-size pocket for cash, receipts or magnetic security cards. It's the perfect wallet for today's digital world, letting you pay with Apple Pay where available, or the old-fashioned way with cash still welcome everywhere. Inside BookBook, your iPhone snaps into a soft-touch shell. With a quick slide to the left, the shell lifts completely out, so you can leave your wallet in a locker and take your phone to the treadmill. Use the viewing stand for hands-free FaceTime calls, watching HD movies on your iPhone or sharing your all-time favourite videos with friends. You can even prop up the BookBook stand and use the self timer.